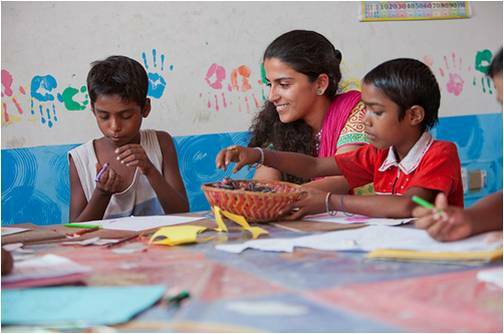 A PULSE Volunteer, Megha, works with kids at a Save the Children learning center in New Delhi, India. (3BL Media) June 27, 2012 - Nearly one hundred GlaxoSmithKline (GSK) employees will be setting out for long term (up to six months) assignments in 2012 with 52 nonprofit and non-governmental organizations in 25 countries. These volunteers will bring needed expertise to organizations working to address serious societal challenges including those in the health education and environmental sectors through GSK’s skill-based volunteer program, PULSE. Since the launch of the PULSE Volunteer Partnership in 2009, nearly 300 GSK employees from 33 different countries have volunteered with 70 nonprofits in 49 countries. Watch this video to learn more about their experiences. Follow the journey of our 2012 volunteers on the PULSE blog. Through a new initiative called PULSE Pillars, GSK will be focusing on multi-year, multi-volunteer projects, strengthening our contribution in key areas: malaria, access to healthcare, and children’s health and education. For the next several years, PULSE will send up to 30 volunteers each year to work on Pillar projects with the following organizations: AMREF (African Medical and Research Foundation), Ogra Foundation, Philadelphia Education Fund and Jhpeigo. PULSE photos are available on Flickr.